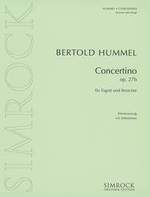 The Concertino op. 27 was written in 1964 as Concertino for basset horn and string orchestra. lt was arranged for bassoon and string orchestra (op. 27b) in 1992. What is astonishing in this three-movement work, with its extremely virtuoso solo part, is the particularly original inclusion of French folk melodies. The melodies and harmonies are primarily based on series of fourths and fifths that, derived from a folk tune, provide the musical material for the "Prologue" (first movement) as well as for the work as a whole. The "Concerto" (second movement) is dominated by a distinctive motif in the bassoon (triplet upbeat, leaps of a fourth and a fifth). This motif also turns up rondo-like in the orchestra in a number of variants. Moreover, nervous scale figures, set against syncopations and uneven rhythms, determine the course of the musical development. Suddenly, another folk tune appears - as a contrasting idea. After a virtuose solo cadenza, this idea is taken up by the orchestra as a cantus firmus. The extremely rapid final measures of this movement are followed by a contemplative "Epilogue," a sort of "antiphonal song" between the first violins (supported harmonically by the rest of the string instruments) and the solo instrument. harmonic invention with frequent surprising rhythmical shifts and even interspersed passages od subtle humour.